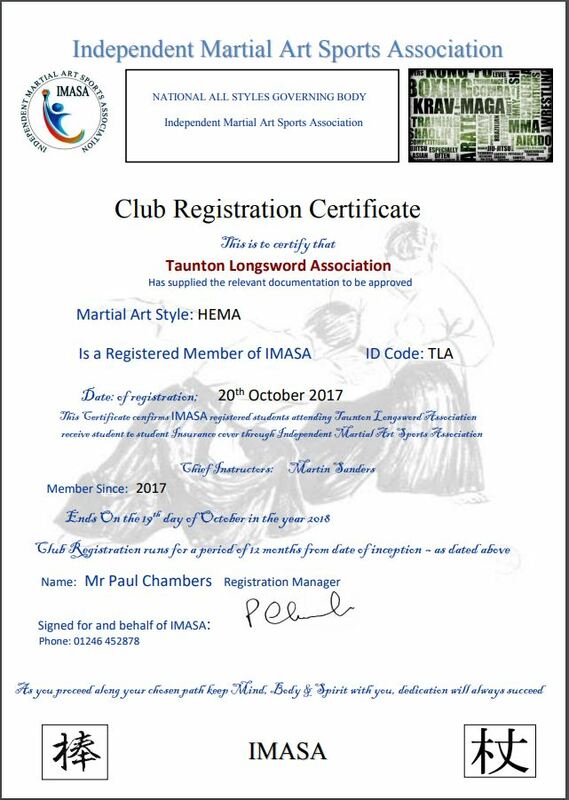 Taunton Longsword Association (TLA) endeavours to combine a friendly, fun, and meaningful sport ethos with best-in-class administration and management. Therefore, on this page, you will find the policy documents that give you peace of mind that you’re in good hands! We subscribe to the Academy of Historical Arts (AHA) codes of ‘Equal Opportunities’ and general ‘Health and Safety’. We also use the standard AHA policy documents as a guide, modified as indicated to be applicable to TLA. For all matters regarding these documents, please contact a member of the TLA committee via the form on this site. Whilst every effort is made to ensure these documents are up to date and without errors, neither any member of the TLA nor the AHA nor the IMASA nor any 3rd party can be held liable if this isn’t the case. Any questions – check out our FAQ page or send us a message. Modified for TLA use, “uniform”: there is no requirement for instructors and students/members to wear different coloured clothing as laid out in this standard policy. Members should wear either a black or white t-shirt when an official club t-shirt not be available/in the wash. Modified for TLA use, “Transportation” (section 13.1): whilst all weapons should be carried sensibly and NEVER in a threatening manner (and NEVER casually swung around whilst walking in public areas) TLA backs “open-carry” and have worked hard with local community groups and the Police to ensure the sight of medieval “weaponry” is not cause for alarm. Members are encouraged to invest in a suitable bag for weapon transport, however this is not a requirement at this time. There may be times where it is prudent for members to conceal their practice weapons when travelling, and the TLA Committee will inform members when this is required. Furthermore, the requirement for members to travel directly from home (or workplace etc) to training and back is not required for OFFICIAL TLA training sessions, as a post-session ‘de-brief’ in another venue is normally undertaken. Members should take care to minimise the number of other venues/businesses visited whilst carrying practice weaponry, and always be sensitive to public concerns. Modified for TLA use, specifically regarding “Prescribed Drugs”: Individual cases will be considered by the committee on merit as to whether participation is allowed at the club. For individual sessions, the lead instructor will have a ‘veto to train’ if concerned about the ability of a person to train safely. Modified for TLA use: The Secretary of the TLA will be the ‘responsible person’ and the only member of the TLA to have access to the data. Requests for information MUST be made using the standard form, or a digital version of it. It will be appraised and actioned/declined asap. Modified for TLA use, specifically the age range: TLA operates an 18+ policy at the time of the first session. However, should younger persons wish to train, an application to the committee should be made and each will be considered upon individual merit. Modified for TLA use: In all cases, informal contact should be made to address any issue directly with the perpetrator by the concerned TLA member, member of the public, or official. Should this not be possible, or failed to achieve positive results, then the TLA committee should be contacted. In all cases, the TLA committee will conduct a discrete investigation and form an official position of the club that will be presented to all relevant parties. Any TLA Committee decision may be appealed, citing specific and descriptive reasons for objection, which will then be discussed. In all cases, the TLA Committee’s decision is final.